Beautiful build on the sanding facility. Nice to include the sand drying stove. In the Background there a baggage car. It looks to me like a Westwood Central Pacific Car, but, did you lengthen it? Thanks Bob! 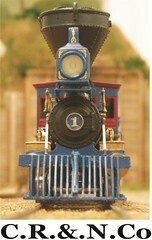 The baggage car is a Westwood kit built with the original length. I have not lengthened it. I have substituted all the wood for styrene though. H�kan, those trees are fantastic and I'm impressed with the structures in your engine terminal. You have a great looking layout. Back after a weekend show just checked in, only thing I can say is wow. H�kan you're doin such a great job here ! Thanks Frederic, George, Mike and Martin! Nice blog Martin! I have watched the surgery on your thread although I liked the scene with the small outhouse the new scene looks great. Yes, LP = Little Person. Wouldn't you enjoy the visit of such a place? a very very small tiny remark: ...your groundcover it is a little bit to clean ?? When visiting this site , always "click" first overhere if anything new! Thanks Jos! I'm happy you like it. Thank you for visiting. I know what you mean with ground cover, its way to orderly and uniform. I have a lot of work on that still to do. Today I did some experimenting with taking some videos on the layout with a freight train as the cast. I have put it out on Youtube with the following link. I hope you all will enjoy it. It was quite fun to do but took a awful lot of time uploading. Now that's my kind of Video! Most excellent. It's the first to be down loaded to my new phone. I'm glad you liked it! The music is there to cover up the gearbox noice and the dynamo and I hope it is not to overpowering. I have not been able to shut the dynamo off as my DCC controller can't program more then to 255 and the dynamo is on 300 something. ESU has planned it for me that I must buy their expensive programmer . Nice video H�kan! A very neat layout and fine rolling stock.